In celebrating the release of Author Sean Beaudoin next book, Who Killed Wesley Payne, BRS is kindly offer a book from the same author for a giveaway! Fade to Blue is acclaimed author Sean Beaudoin's wildly innovative novel combines uproarious humor with enough plot twists to fill a tube sock. Part thriller, part darkly comic philosophical discussion, and accompanied by a comic book interstitial, Fade to Blue is a whip-smart romp that keeps readers guessing until the last paragraph. Sophie Blue started wearing a black skirt and Midnight Noir lipstick on her last birthday. It was also the day her father disappeared. Or spontaneously combusted. Which is sort of bad timing, since a Popsicle truck with tinted windows has started circling the house. Kenny Fade is a basketball god. His sneakers cost more than his Jeep. He's the guy all the ladies (and their mommas) want. Bad. Sophie Blue and Kenny Fade don't have a thing in common. Aside from being reasonably sure they're losing their minds. A new friend, Ammy Belle from The Book Fort highly recommend the book. You can read her review HERE. 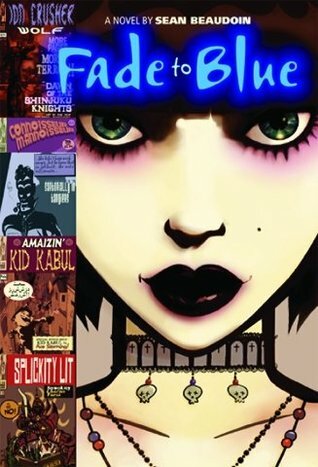 One lucky reader will win a signed copy of Fade to Blue by Sean Beaudoin. Giveaway is open to US mailing address only (sorry International peeps!). Leave a comment on this post with your email address so that I can contact if you win. No email address, no entry! Giveaway ends January 31st, and the winner will be announced on February 1st. The prize will be shipped directly from BRS. Hadn't heard of this, but definitely looks original. Great giveaway! Would love to win this mystery novel by Sean! I also commented on Sean's guest post. I love the cover. Covers tend to be what win me over often.